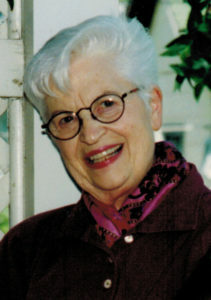 Her sons by her side, Ruth Black was receiving care at the Hospice House in Dayton. As staff members learned about the family, they understood the central role music played throughout all their lives. Son Patrick Black, a musician, asked if he could play the grand piano down the hallway. With the help of staff members who moved her bed and stood by with tears in their eyes, Patrick played a serenade for his mother. Ninety-five-year old Ruth, eyes closed, was peaceful as he played his way through a series of ballads. Ruth was a young trailblazer. In high school she decided she wanted a role no woman had ever held before at Muncie Central in Indiana. She wanted to be the drum major. 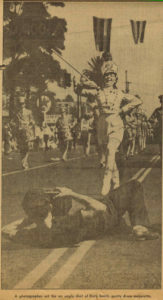 When she shared her ambitions with the lead trumpet player, he decided he would try out for the role rather than “be led around by some girl.” He claimed the drum major mantle, but after his graduation, in 1935, Ruth became the first female drum major in Muncie Central High School history. Their competition evolved into courtship; then marriage; then four children and a lifetime together. 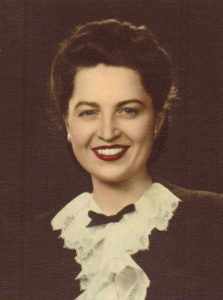 Married to her former rival, who had become a professional trumpet player, Ruth accompanied her husband on band road trips and enjoyed dancing and being part of the audience. When they started their family, the couple moved into a house right next to the arts building on the Ball State University campus. 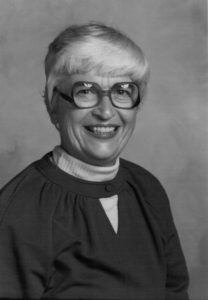 Ruth wanted to enrich the lives of her children with the easy exposure to ideas and the arts found on the college campus. When her youngest child started kindergarten, Ruth decided to attend college and earn her degree. Graduating at age 47, she began her 23-year teaching career at Troy High School. After retirement, she became a docent at the Dayton Art Museum, providing educational tours. She stopped only when she began to worry she might stumble and sustain a serious injury. 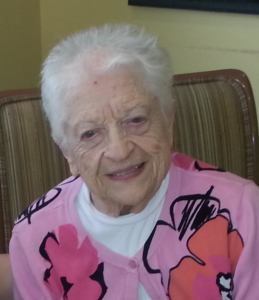 Ruth provided care for her parents and her husband as their health waned. Her sons call her a “giver” whose ability to nurture others seemed of endless reserve. Pictured at left on her 95th birthday, Ruth celebrated with her family. At her bedside, they marvel at her life and the energy, passion and perseverance she brought to it. As more people began to gather for his private concert, son Patrick thoughtfully selected a song to close his very personal performance honoring his mother.